Everyone is talking about the problems with the economy. Plumas Bank and Strategic Communication Consulting Company are determined to do something positive to help our local economy. Plumas Bank and Strategic Communication Consulting Company are partnering with women in the community to support business growth, development and success. Leslie Brown, owner of Strategic Communication Consulting, and Rose Dembosz, Executive Vice President and Manager of Operations at Plumas Bank, invite the Lake Tahoe communities to participate in the first of a series of free, community forums. They will discuss the area’s current employment climate, how to put forth your best to attract the best, how to maximize your hiring process, and how to retain top employees – all vital processes for a successful business. The first Women in Business event is scheduled for Wednesday, May 6, 2009 from 8:30 to 10:30 a.m. at the Sawtooth Ridge Cafe in Tahoe City located at 877 North Lake Blvd. Seating is limited. Contact Debbie Sajdak at Plumas Bank, 581-2857 ext. 1010. Lake Tahoe is one of our nation’s most prominent historical areas. Its dynamic geologic and natural history provide the backdrop for its rich cultural heritage. The Gatekeeper’s Museum in Tahoe City features exhibits that focus on this history, from the Washoe Indians through development of the Tahoe basin, including the Marion Steinbach Indian Basket Collection, which features basketry from 85 tribes, representing traditional to contemporary styles. The Gatekeeper’s Museum will open May 1, Wednesday through Sunday from 11 a.m. to 5 p.m., then daily beginning June 16. Call 583-1762 or visit http://www.northtahoemuseums.org. Located just south of the “Y” in Tahoe City. Donations are an important part of hospice fundraising. 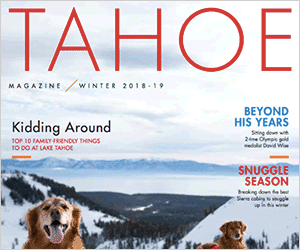 All proceeds from the Tahoe Forest Hospice Gift and Thrift in Truckee and Kings Beach support hospice services throughout the Truckee-North Lake Tahoe area. They welcome clothing, shoes, books and house wares including small appliances in good working order. Please ask for approval before unloading furniture or TVs. Ensure unwanted or unaccepted items are not left outside the store, as they incur fees to remove. Thank you for donating. Call 582-4947 in Truckee or 546-5494 in Kings Beach. Attend a favorite locals event, the KidZone Museum’s 7th annual fundraiser. Join us for the Texas Hold ‘Em Poker and Party on Saturday, May 2, at 5 p.m. at the Olympic Village Lodge in Squaw Valley. Enjoy a rip-roaring evening of gambling, entertainment, dinner, live music, and more than $10,000 in silent auction items and prizes. For details or to purchase tickets, visit http://www.KidZoneMuseum.org. Tickets: $60 for tournament play and $20 for basic entry which includes dinner, entertainment, music, bull riding, dancing, prizes and much more. Enjoy a $99 suite at The Village at Squaw. All About Kids is offering discounted rates starting at $12 per hour. North Tahoe Arts invites submissions of art to celebrate the “The Art of Food” from farm to table. We are looking for all fine art media, including painting, photography, sculpture, ceramics, jewelry, functional art, craft, poetry and music and objects made from food (gourds, dyes, etc.). To complement the exhibit, there will be a series of events to dovetail with the Tahoe City Farmers Market (Thursdays), inviting chefs, farmers, vintners, and artists to share their creativity. Deadline: May 6; jury meets May 7. Also, check out a Friday’s gallery showing of artist and poet Yasmin Sayyet from 5 to 7 p.m. At North Tahoe ARTS 380 North Lake Blvd. Tahoe City.